As of Saturday June 6th, over 3,000 villagers have fled the area of Ler Per Her IDP camp in Dta Greh Township, Pa'an District to seek refuge in neighbouring Thailand. This includes villagers fleeing joint SPDC/DKBA attacks against the KNLA as well as those fleeing forced recruitment as porters to carry supplies for SPDC and DKBA troops engaged in the fighting. This is the largest refugee exodus from Karen State on a single occasion since 1997. Also, more refugees are expected as joint SPDC/DKBA forces have advanced towards the camp of KNLA Battalion #202, about 30 kilometres north of Ler Per Her. 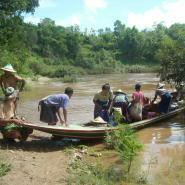 On June 5th 2009, KHRG reported that over 700 villagers had fled to Thailand between June 2nd and 5th in order to avoid forced labour carrying military supplies for joint State Peace and Development Council (SPDC) / Democratic Karen Buddhist Army (DKBA) forces in an attack on a Karen National Liberation Army (KNLA) camp. This KNLA camp is located near to Ler Per Her camp for Internally Displaced People (IDPs) in Dta Greh Township, Pa'an District. At the time, displaced villagers residing at Ler Per Her had already begun to leave in expectation of the coming SPDC/DKBA attack. By the end of June 5th, the entire civilian population of Ler Per Her had fled to Thailand. Subsequently, on Saturday, June 6th, according to KHRG field researchers operating in the area, SPDC soldiers from Light Infantry Battalions #202 and 205 and Infantry Battalion (IB) #81, under Light Infantry Division (LID) #22, along with DKBA soldiers from Brigade #999 began attacks on KNLA Battalions #101, 21 and 22, of Brigade #7, based near to Ler Per Her IDP camp. 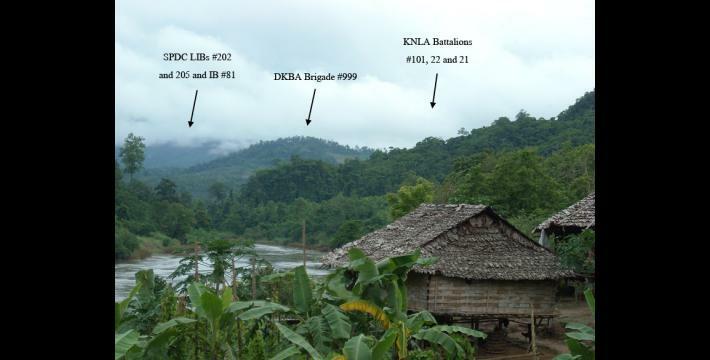 At approximately 1:00 pm on June 6th, SPDC soldiers located atop Bpoo Loo Htoo hill overlooking both Ler Per Her and the KNLA camp, began shelling the KNLA camp with multiple 81 mm mortars. Then at about 3:40 pm, the SPDC and DKBA soldiers advanced in a ground attack on the KNLA camp. The Dta Greh Township chairperson, himself a local villager, has estimated that over 900 combined SPDC and DKBA soldiers are involved in the current attacks. At around 6:00 pm the same day, the fighting died down somewhat but occasional rifle shots continued. On the morning of Sunday, June 7th 2009, local KHRG field researchers reported that fighting had resumed in the Ler Per Her area. Including those villagers from the surrounding area, over 3,000 refugees have now fled to avoid the attacks as well as forced labour carrying military supplies for SPDC and DKBA soldiers. This is the largest refugee exodus from Karen State on a single occasion since the SPDC's massive 1997 offensive in Dooplaya District further south. The villagers from Ler Per Her and the surrounding area are now taking refuge at numerous areas in Tha Song Yang District of Thailand's Tak Province. 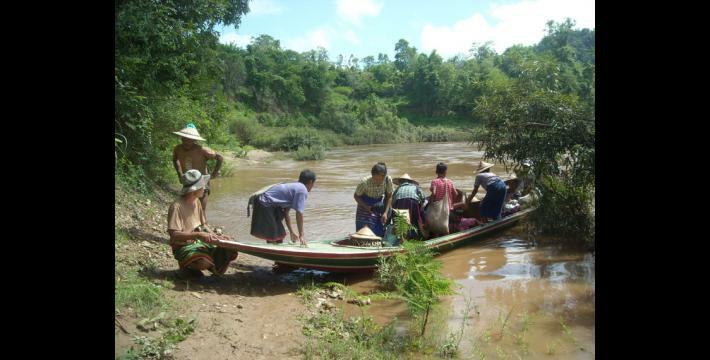 As many villagers have fled to different locations, KHRG field researchers operating in the areas do not yet have the exact number of refugees from some of the abandoned villages. Available numbers of the people and households from Ler Per Her and nearby villages who have recently fled to Thailand are indicated in the table below. Other sources reporting the recent displacement have cited similar figures. 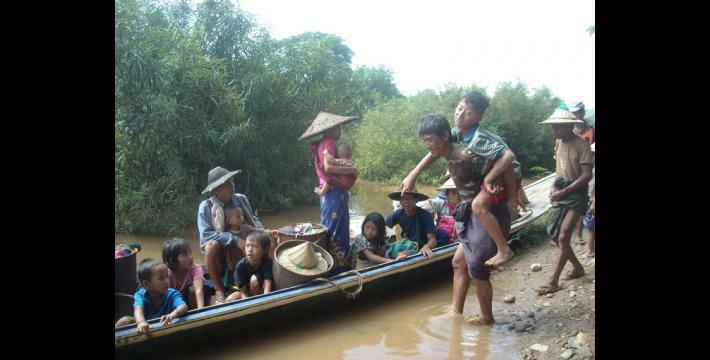 According to the Karen-language news agency Kwekalu, more than 3,400 villagers have fled to Thailand from the area and have taken shelter at Htoo Hta, Mae Ploo, Au Thoo Hta and Mae Salik. The Free Burma Rangers have reported that 3,295 villagers have fled to Thailand from the Ler Per Her area and have taken refugee at Mae U Su and Noh Bo as well. 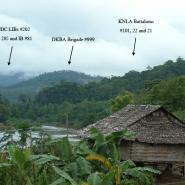 Meanwhile, as attacks and displacement in the Ler Per Her area continue, combined soldiers from DKBA Brigade #555, under the command of Bya Bya, and SPDC LIB #201, also under LID #22, have advanced towards the camp of KNLA Battalion #202, which is located along the Moei River bordering Thailand, about 30 kilometres north of Ler Per Her. Expecting that the joint SPDC/DKBA forces will soon attack this area as well, residents of nearby Kler Khah, Htee Khoh Kee and Meh Gkreh villages began leaving for Thailand on Sunday, June 7th. A KHRG field researcher operating in the area has reported that those who have not yet left these villages are planning to flee shortly. As it is now rainy season, these refugees, including many women and children, face serious humanitarian concerns and are in urgent need of support including blankets, mosquito nets and plastic tarpaulins. They lack sufficient shelter, food and heath provisions and schools have had to shut down. Local groups have already provided some assistance, but this has been limited. The Karen Refugee Committee (KRC) has provided about a week's worth of food aid, but as more refugees arrive, this aid will have to be spread between larger numbers of people. The international community must not continue to neglect the ongoing humanitarian and human rights crisis in these areas. 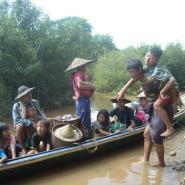 Over 700 villagers flee to Thailand amidst fears of SPDC/DKBA attacks on a KNLA camp and an IDP camp in Pa'an District, KHRG, June 5th 2009. "As the SPDC attacks, more than 3,000 villagers flee to Thailand," Kwekalu, June 6th 2009. "Thousands of Refugees Flee Ler Per Her Camp as Burma Army Attack Begins," Free Burma Rangers, June 6th 2009. For a more in-depth discussion of the limits of the recent international focus on Burma, see the KHRG commentary Don't neglect rural in calling for Suu Kyi's release, June 4th 2009.